Pompey are waiting to discover the full extent of Gary Roberts’ hamstring injury. The midfielder lasted just seven minutes of Tuesday night’s defeat at Barnet before having to leave the pitch. The problem had troubled the 31-year-old since last weekend’s trip to Yeovil, sidelining him during training. Regardless, Paul Cook opted to run the risk of naming eight-goal Roberts in his side for the trip to The Hive. Instead the injury flared up again and Kal Naismith was summoned from the bench to replace him in a midfield reshuffle. Pompey’s medical team are now assessing the damage to Roberts, having given the complaint time to settle down. The likelihood remains, however, he will miss the visit of Cambridge United at the very least. 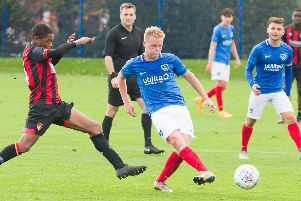 It represents another blow to Roberts, who has endured an injury-hampered time at Fratton Park since his summer arrival from Chesterfield. So far he has made 25 appearances, with an ankle problem sidelining him for two months until mid-December. Meanwhile, Gareth Evans remains a doubt following the hamstring problem he sustained against Yeovil. Along with Roberts, he has also scored eight goals for the Blues during the current campaign and emerged as a key performer. The injury kept him out of the Barnet match and it remains to be seen whether he is available for the Cambridge clash. In addition, Brian Murphy has recovered from his concussion, but has now picked up a calf problem. The keeper has not played since the January visit of Ipswich in the FA Cup.